Seven News US Bureau Chief Mike Amor has been named TV Journalist of the Year at the Los Angeles Press Club’s 58th annual Southern California Journalism Awards. The awards recognise journalistic excellence in print, radio, television, and online. Amor was recognised for an outstanding body of international work, including coverage of the Charleston church massacre and the Paris terrorist attacks in November last year. “With his ability to tackle a wide range of topics – whether a portrayal of the environmental impact of the Salton Sea or an engaging profile of entertainer Tracy Chapman – the Australian journalist Mike Amor can be lauded for jobs well done. His writings, coupled with outstanding photography and editing, easily earns him the Television Journalist of the Year Award,” said the judges. Seven News picked up a total of 6 awards yesterday. Angela Cox accepted the award in the News – Foreign Correspondents category for Seven’s coverage of the San Bernardino massacre in December last year. Other honours included the Lifestyle Feature TV and Environmental Reporting awards for Saving the Salton Sea, a special report about the drying up and pollution of California’s largest lake. In the Personality Profile category, the team accepted the award on behalf of Amor for his profile of Grammy Award-winning American singer-songwriter Tracy Chapman. And a two-part series on the Apache holy site in Arizona under threat by a new mine earned the TV News Feature award. 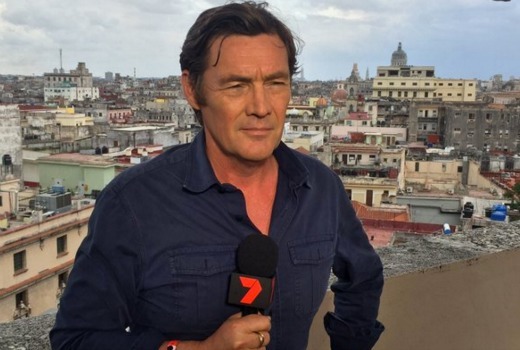 Earlier this year, Seven News earned an international Edward R. Murrow Award. Wow, so many wins. Congratulations to all. Well done. He is also doing a great job hosting Sunrise at the moment.